In the 1990’s, Wilfrid Laurier University’s athletic facility only had four washroom stalls for the women’s athletic teams and the women’s change room was only a third of the size of the men’s change room. Now, as of 2019, Laurier women’s varsity teams have won 36 out of the 73 OUA championships and seven of the 14 national championships in the school’s history. Over the past 20 years, the growth of women’s sports at Laurier has been nothing short of exceptional. Although it would be easy to say that the progression of women’s athletics is a byproduct of an increased athletic budget and the natural growth of the school, there are numerous steps that Laurier has taken in order to make sure that there is equal support for both women’s and men’s sports. The first and most important decision that Laurier took to make sure women’s sports weren’t getting left behind was changing the athletic facilities. “We had to renovate the facility and make it an equitable space. So what you see in the men’s change room is what you see in the women’s. All the dressing rooms for the two basketball teams and the two soccer teams are the exact same,” said Peter Baxter, director of athletics and recreation at Laurier. Baxter began his Laurier career 21 years ago and he has played a major role in changing the culture around women’s sports at Laurier. “21 years ago when I came here, the infrastructure wasn’t here. We had a building that was built in the 70’s and it was meant for male participation. Back then, the women didn’t participate in high performance sports. There was a 3000 square foot free-weight room for mainly the football team to use. A lot of women were intimated to use that area,” he said. Funding was one of the biggest concerns for women’s athletics, but as university and college sports expanded in Canada, budgets started to increase and this gave Laurier a platform to improve the equity between men’s and women’s sports. “In terms of inter-collegiate teams, a lot of women’s sports were dreadfully underfunded. The whole athletic department had a small budget at the time. It was less than a million dollars and we only generated about $200,000 in revenue. Back then we were about 5800 students and the university strategically said that if we want to grow, we got to have proper facilities to attract students,” Baxter said. “We had a lot of equipment that put people in vulnerable positions. So we bought new equipment that made people more comfortable. We had to make sure that people were comfortable while doing physical activity without feeling like they are being leered at,” he added. This change has been evident because of the diversity you see within Laurier sports and at the gym in the Athletic Complex. It’s no longer just people of a certain gender, body type or weight who are engaging in physical activity. The improved inclusivity has been one of the keys behind the growth of women in sports at Laurier. Once these changes implemented by the university and the athletics department were put in motion, success started to follow. Many of the most important Golden Hawks and teams in Laurier’s athletic history are women. One of the first and most crucial moments in terms of Laurier women’s sports history was the Golden Hawks soccer team bringing home the national championship in the early 1990’s. This helped the school develop a bigger and better women’s basketball and hockey program which led to even greater success in the future. “Our women’s soccer team had won a national championship in the early 1990’s, but we were woefully underfunded. We worked towards improving that over a number of years. Once athletic scholarships began, we made a commitment to [distributing them] equitably between female and male athletes. We first targeted women’s hockey and women’s basketball,” Baxter said. The Laurier women’s hockey program is considered as one of the best hockey programs in the country due to the tremendous success the Hawks’ experienced in the mid-2000’s. The Hawks won seven consecutive OUA championships from 2004 to 2010, including a national CIS championship in 2005 under head coach Rick Osborne. One of the most iconic hockey players in Laurier hockey’s history, Cheryl Pounder, was also a pioneer for women’s sports at Laurier. The transformation of women’s athletics at Laurier over the past 20 years has changed and improved the sports culture at the school. The atmosphere around varsity sports has gotten better and the Golden Hawk is emotionally connected with every Laurier student. Pounder, a two-time Olympic gold medalist, made a name for herself at Laurier before women’s athletics were at their peak. “Cheryl was driving to games with the women’s hockey team. It was a club at first then it became an OUA sport. She had to buy her own jersey,” Baxter added. The success between the soccer, basketball and hockey teams translated into the development and growth of women’s curling, rugby and lacrosse. The curling school reputation is intact not only because of the OUA and national championships that the school has won, but also due to the post-collegiate success of numerous Laurier curlers such as Laura Walker and Sarah Wilkes. Walker is a national junior champion and a world junior silver medalist, while Wilkes recently won the 2019 Scotties Tournament of Hearts. “We invested in coaches. Our vision was always [to] invest in people, improve the product and win. We define winning as more than just scoreboard success. It’s academic success, athletic success and community service,” Baxter said. The success of Laurier athletics’ vision has not led to any complacency. In fact, the attention on women’s athletics has only intensified over the years through events like the Outstanding Women of Laurier (OWL). The OWL event, which began in 2006, honours female athletes who not only excel in their sport, but also in their community. The progression of women’s athletics and the attention that female athletes receive at Laurier is something that is unique to the school. In mainstream sports, the women often take a back seat to the men when it comes to receiving adequate media coverage. The argument has always been that men are physically and athletically superior and therefore people are more likely to watch the men since they are attracted to a superior product. Even though this isn’t necessarily false, the lack of marketing of mainstream women’s sports is alarming. It’s difficult for sports fans to consume women’s athletics because women’s sports simply aren’t marketed as much as they should be, creating a lack of awareness within the audience. At Laurier, this isn’t the case. If you walk into the athletic complex, you will see an equal amount of photos and posters featuring both female and male Golden Hawks. The equitable marketing leads to the stands being nearly full at every big Laurier varsity sports game, whether the game features women or men. There is also a real camaraderie between the Golden Hawk varsity teams. “Our teams support one another. You’ll go to an inter-collegiate game and you’ll see the men’s football team cheering on the women’s basketball team. You’ll see the rugby team at hockey games cheering us on. There’s a really good sense amongst our student athletes of supporting one another. This is important because I’ve been in athletic departments at other schools and I’ve seen rivalries between teams at the school,” Baxter said. Laurier has a rich history of iconic female athletes who have paved the way for women’s sports to thrive over the years and one of those icons is swimmer Jasmine Raines. Although Raines’ Golden Hawk career is far from over, she is well on her way to becoming a Laurier legend because of her accomplishments. Raines has received lots of recognition from the university and the media throughout her career with the purple and gold. “Laurier does an excellent job of including everyone. Everybody gets the recognition they deserve. I couldn’t thank the [athletic] department enough for all the support they’ve given to both genders and giving us excellent opportunities to pursue our academics and athletics at Laurier,” she said. Raines has won two bronze medals at the U-Sports national swimming championships over the past two years to go along with six OUA medals in her career. When asked about her thoughts on the Outstanding Women of Laurier event, Raines mentioned that she has been encouraged to apply for the prestigious award next year. The improved atmosphere and culture has led directly to athletic success. 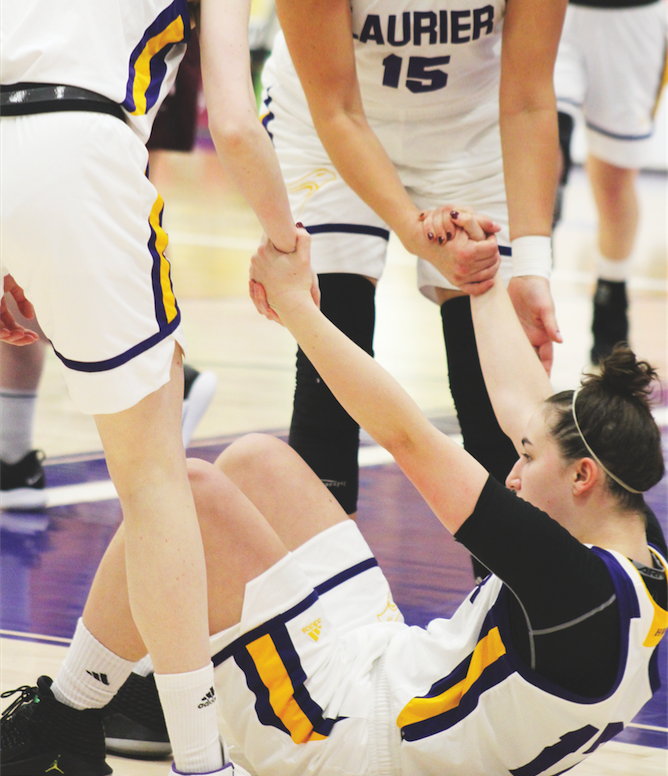 Laurier women’s varsity teams are now responsible for almost half of the school’s total OUA and national championships and with the way things are going, Laurier fans can expect more championships from the women’s teams in the future. None of the Laurier women’s varsity teams were able to capture an OUA championship this past season, but there were still some stellar individual seasons from athletes like Jasmine Raines in swimming, Sydney Pattison in middle-distance, Rose Williams in lacrosse and Jill Condron in basketball, just to name a few.